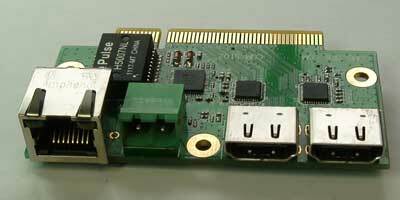 Plug-in card provides FPGA-based ComBlock modules access to Gigabit Ethernet Network and HDMI devices. MAC and IP stack functionality to be implemented in the external FPGA. Includes AD8195 buffers with Pre-Emphasis and Equalization in both In/Out direction, for longer HDMI cables.